Every day was spent riding up and down our street, or perhaps around the court if I was feeling adventurous, before returning to the gleeming aluminum Airstream travel trailer where we lived while our brand new U.S. Home was being built. When we settled into our new house, I finally got around to learning to ride the bike without training wheels. My dad held me by the banana seat, jogging next to me as I became accustomed to the precarious process of turning left and right and keeping the bike upright, waiting until the moment he was absolutely certain that I could handle it all on my own. It was an impressive display of love from a man well into his fifties who had only years before suffered a near fatal heart attack. But at the time it had never crossed my mind. I was five years old after all, and I was just thrilled that my dad was teaching me to ride a bike. I can still remember the horror of looking back and seeing him standing twenty feet behind me and then the euphoria of realizing that I was doing it all by myself. That was almost thirty years ago, and I remember it like it was yesterday afternoon. 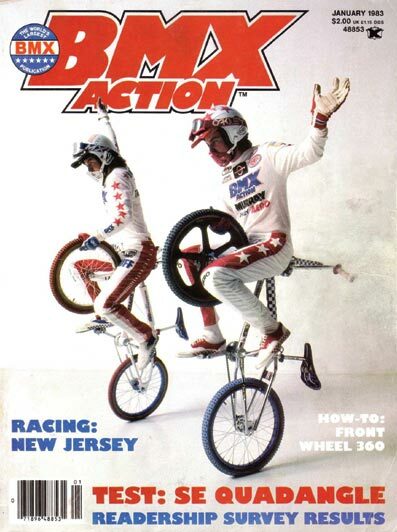 Years later, on a trip to Disney World, my dad bought me a copy of BMX Action Magazine to keep me busy on the two day road trip from Texas. Seeing the photo of R.L. Osborn and Mike Buff sitting atop their handlebars and riding unicycle style was all it took. I was hooked, and I absorbed the rest of the magazine like a sponge. By the time we reached the Fort Wilderness campground, I had memorized every single page. I could have told you the name and sponsor of every ABA pro on the circuit. Greg Hill on his GT, Harry Leary on his Diamond Back. And while the vacation itself was unforgettable, from that moment on, all I thought about was BMX. I can’t imagine how annoyed my dad must have been having to listen to my incessant pleas for a new bike all the way home from Florida, but sure enough, just a few months later, the old man finally cracked. On a trip to the local Wal-Mart, my dad quietly led me to the bicycle aisle, and with a subtle grin, asked “how about that blue one?”. It wasn’t a Mongoose or a GT or one of the prestious brands that the “famous” pros might ride, but it was BMX bike, a bright chrome Murray X20 with blue vinyl pads and a hard plastic seat that any proper BMX bike should have. The bike had heavy welded front and rear dropouts and a beefy straight fork that proclaimed that this was a “real” BMX bike and not just some department store Huffy. Besides, R.L. Osborn rode a Murray in BMX Action Magazine and that was enough for me. And while the X20R sitting next to it had red nylon pads, front brakes, and a freewheel, it was forty bucks more. “The blue one looks great dad”.